I met Guy at the entrance of the Jardin Ahuntsic, a beautiful community garden sloping up to the south of Sackville Street. He started cultivating a plot of this garden 2 years ago. His plantations are quite varied and growing well this year. Insofar as his dwelling place would allow it, he always had a small piece of land to cultivate. It's a habit that comes from his mother. As is often the case in the area, the soil here is clayey; a plant that grows well in it is the tomato. Guy chose the Florida cultivar. I thought the places were few and that there were long waiting lists to get one in a community garden. He said he got his pretty quickly and has already seen some turnover. People without gardening experience make a first try and then give up. These are often people who do not measure the daily involvement necessary to maintain a vegetable garden. They buy ready-made plants, put them in the ground, go on vacation three weeks without seeking a caretaker and then return to find that everything has withered. For him, the garden is a daily haven after work in a green oasis. Guy knows his way around in Greater Montreal. Grown up in the Mile End in Montreal, he lived in different districts of the city, then on the South Shore and the North Shore. Production Manager in a printing shop in St-Laurent, he came to live in the Sault-au-Récollet district two years to be closer to his work. The fact that his children are well on their way in life after successfully completing their studies also favored his return to the city. The company where he works is active in two sectors, general commercial printing and music publishing. It makes everything that is connected with the packaging and promotion of recorded music. I wish him a good harvest. 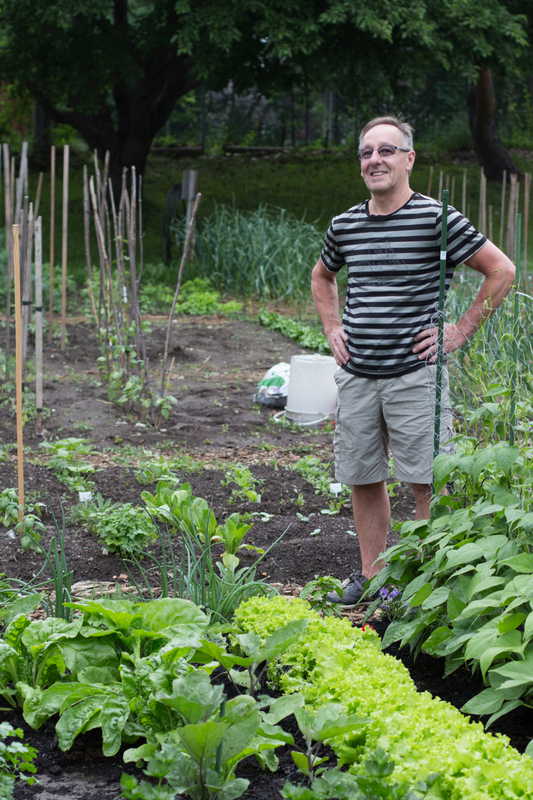 Guy standing behind his vegetable patch at in the Jardin Ahuntsic, a community garden.